The homocysteine test measures the homocysteine blood level. The homocysteine blood test measures the homocysteine blood level. Why is a homocysteine blood test important? This homocysteine lab test helps assess one's risk of a future heart attack or stroke. This Homocysteine Test is a blood test. The homocysteine test, also known as a homocysteine blood test and a homocysteine lab test, measures the homocysteine blood level. Homocysteine is an amino acid that results from the breakdown of another amino acid called methionine. Homocysteine has gained prominence as an independent risk factor for cardiovascular disease. Elevated homocysteine blood levels, or hyperhomocysteinemia, likely indicate an elevated risk for heart disease and damage to the blood vessel walls (especially arteries). Given its importance for cardiovascular screening, the homocysteine test is often ordered with the CRP test or the lipid profile test or as part of a more detailed heart blood test panel. A segment of the population has very high homocysteine levels. These people have a condition called hyperhomocysteinemia which is characterized by homocysteine blood levels greater than 100 umol/L. Typically caused by a genetic (autosomal recessive) mutation, people with homocysteine levels in this range can develop visual problems, disabilities, and abnormal clotting as they age. One cause of high homocysteine levels that has become more prominent in recent news is a mutation in the gene known as MTHFR (methylenetetrahydrofolate reductase). MTHFR is an enzyme involved with metabolizing homocysteine in the body and mutations in the C677T and A1298C positions of this gene are commonly found in people with high blood levels. Vitamin deficiencies can also cause homocysteine levels to be too high. In particular, vitamins B6, B9 (folate) and B12 are required to metabolize homocysteine in the body and, in the absence of them, homocysteine cannot be broken down. The folate test is somewhat easier to test for than B6 levels, and vitamin B12 deficiencies can be identified using the standard B12 blood test or the methylmalonic acid test to look for early deficiencies. In most cases, adequate supplementation can be done to correct high homocysteine that is the result of these B vitamin deficiencies. Getting a homocysteine test near you is relatively straightforward. Simply order the lab test online and get your blood drawn at the selected Quest Diagnostics lab. Once the homocysteine lab results are available, they can be downloaded electronically. 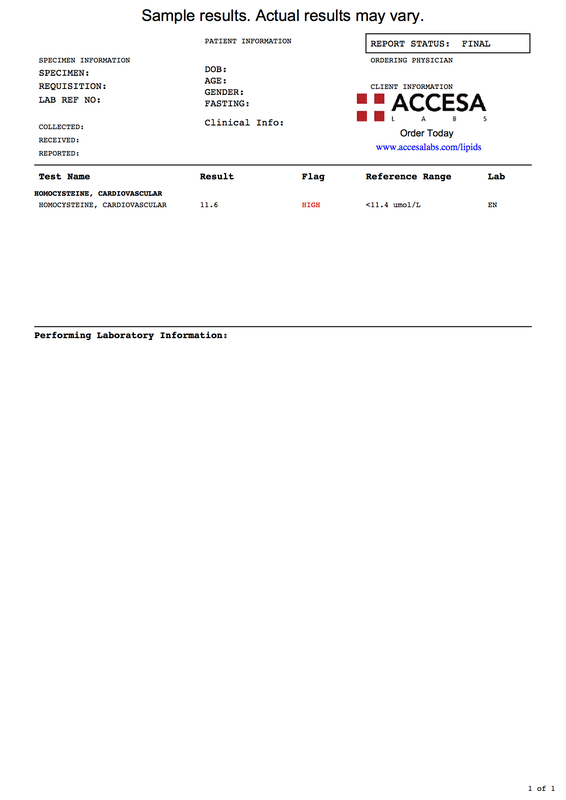 As can be seen on the sample homocysteine lab report above, homocysteine blood levels are reported as a number in umol / L and can be compared against a reference range provided by the lab. Homocysteine Test at Guaranteed Prices.